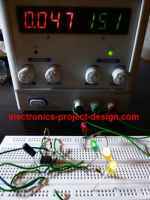 This electronic time clock application note uses an 18 pin PIC16C54 microcontroller as its core in the display and settings of a simple 4 digits electronic clock. The four 7 segment displays are connected in a multiplexing method and each segment is sequentially by controlling the Common Cathode of each 7 segment. The common cathodes are connected to 4 pins of PORTA of the microcontroller. When the pin in PORTA is LOW, the transistor connected to it will turn ON and that particular 7 segment is turn ON. PortB will activate the segments of that particular 7 segment that has been chosen. By multiplexing the selection of the 7 segment sequentially, an equal brightness of all the 7 segments display will be achieved. Multiplexing has the advantage in that it helps to reduce the number of ports needed to connect to the 7 segments. It also keep the cost of a device low as fewer parts are needed. The setback is that the display may not be as bright as if it is driven directly without multiplexing. The 3 switches are also connected to PORTB. They are pulled down to logic "0" by using a 10k ohm resistors. Inputs of the switches are detected as logic "1" by the MCU by connecting a pull up resistor to the VDD. Pressing SW1 changes the seconds setting, SW2 the minutes setting and SW3 the hour setting.